Reverend Tuckworth (surely it should be The Rev Tuckworth, or, when spoken to, just Mr Tuckworth) is the vicar at Bellminster, a pretty cathedral town in the countryside of the English Midlands, in the year 1833. We are never told what his Christian name is, but he "was not an especially old man, as old men judge age, but he felt old, and that amounted to the same thing". His wife had died of cancer years five years before, so he lives with his daughter Lucy and Mrs Cutler, his housekeeper. He is short and stout, so has increasing difficulty with his clerical collar "which was becoming tighter with each passing year, and now nearly choked him". He wears spectacles on his "cherubic" face. "His face, full and soft, was kind but not merry, sympathetic yet sad, the sort of face you would have thought was made to smile at the least provocation, though it very rarely did so." When we first meet him, he is due to retire at the end of the year, having served in Bellminster for thirty-three years. He has two overpowering secrets that he has to keep to himself. First, "he had lost his faith. This was his secret pain, the wound that would not close, the suffering he must not share. That which had sustained, not just his own spirit, but the spiritual life of an entire community, had dried up inside him." He "would have prayed for the rebirth of his religion, but who was there to answer such a prayer?" But he is still ready to accept the offered role of Dean of the cathedral, as he feels it would just be an administrative responsibility - and he has a deep love for the cathedral. His other secret was that when his wife had been wasting from cancer and was in agony, he had committed "his one unforgivable act of love, the dreadful night he ended her suffering when God would not". It was after this that his faith "shriveled inside him like a dried flower pressed hard by pain and loss". In the stories, he becomes increasingly involved in helping to solve the murders that start happening around him. A grateful police inspector even congratulates him on having "a detective's gift for intuition". As another character tells him, 'That's what you've got a gift for, seein' through a man". David Holland (1959 - ) has a Master's Degree in English (specialising in Victorian literature) from Purdue University and also spent six weeks studying Victorian literature at the University of London. He began teaching at a junior college then left to become a copywriter for an advertising agency. Ten years later, his first novel, Murcheston: the Wolf's Tale, was published. This was a Victorian gothic tale about a werewolf, in which Rev Tuckworth does not appear. There followed the three Tuckworth novels. Holland became the creative director of WHAS Radio in Kentucky, and Public Relations Director for The Kentucky Center for the Performing Arts. He has lived in Louisville, Kentucky all his life, and is married with a grown-up daughter. 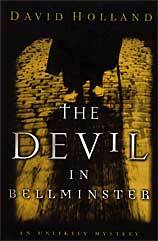 The Devil in Bellminster is a serial killer of at least seven people. And he likes to kill each of them in two different ways, although, of course, by the time he reaches the second more spectacular method (such as crucifixion), they are already dead. Set in the "quaint quiet world of Bellminster" in 1833, the author describes it as "an unlikely mystery", and that it is. The author's style can be slightly pretentious, as when he describes how "the wind threw out an arm to embrace the brick walls of the mill-works, where three black smokestacks thrust their dirty fingers upward, reaching greedily toward the distant moon, eager to escape the night's wild caress". And the unidentified murderer "pauses for a moment, lifts gray, almost colorless eyes .... cold eyes, eyes that pierce the night." When the young artist, Raphael Amaldi, who is in love with Lucy tries to paint her, she finds it hard to smile for him. The memory of the last murder was too strong. "He could not draw what was not there, and her eyes held no joy today. With a sigh he stepped back from the canvas and looked at his subject, studied her mood, peered past her charming features into her heart. His own eyes briefly reflected the sadness he found within, turned it upon himself, saw his own hopeless longing in the mirror of her soul. Then, with spark and a flash, he rushed at the image again, his hand a whirlwind, his mind afire with inspiration". Yet it all holds the interest, and is often fun to read, as when the domineering mill-owner McWhirter explains that the first murder of the beheaded sexton must have been "some sort of vendetta killing! A Neapolitan intrigue. The axe, the way the body was arranged, any fool could see the hand of an Italian in it! .... The heat of the Mediterranean sun does it, boils them from inside." Then, not having any confidence in the local constabulary, he sends for a Bow Street officer, and Detective Inspector Myles duly arrives. But did they really have Detective Inspectors in those days? Anyway, it is a fine fantasy world that the author has created. It seems brave of an American author to choose an English pre-Victorian setting, even if it is marred occasionally by references to "Reverend Tuckworth" or "Reverend Mortimer", this use of Reverend belonging more to contemporary America than pre-Victorian England. So it is highly unlikely that another clergyman would address him, face to face, as Reverend Tuckworth. Nor would even a crazed old woman be likely to address him as "ol' Vic"! Inspector Myles does not take long to arrest the wrong man, but the important thing for him is to make an arrest so that the people of the town can sleep soundly. "I give them a suspect, one that fits the available facts. Perhaps another suspect will do as well, perhaps not." This spurs Tuckworth to pursue his own investigations, but, although he and Myles keep almost capturing the murderer, "a figure cloaked in black", he slips away from them, time after time. Before he is finally caught, he manages to burn the cathedral down to the ground. It is not a book for deep religious insight, as the only character who seems to hear and respond to God's call is the murderer - and he is clearly off his head: "He didn't want to kill! It was God's will, not his own, that drove him to it." But it makes an interesting mystery story. The Devil's Acre is a London underworld area, providing sanctuary to criminals of all descriptions, and it is there that Tuckworth ventures in search of information about the killer of a murdered man at the home of Hamlin Price. Hamlin Price is a mysterious and increasingly sinister philanthropist whom Tuckworth is trying to persuade to help finance the rebuilding of Bellminster Cathedral, burnt down at the end of the previous book. The London of the time is convincingly described as "a jangling, peeling, stinking, blinding, shrieking, glittering, braying spectacle. The dean clapped his cupped palm to his nose, failing to block the stench seeping through the city. Street offal and burning metal - smoke and spice - oil and sweat - cabbage and death created a pungent tapestry, single threads of odor adding to a greater, viler, more noxious whole". As Tuckworth is now a dean, there is no longer any need to refer to "Reverend Tuckworth", and indeed Mortimer, the interfering and incompetent rector, now correctly refers to him as either dean or "Mr Tuckworth". Tuckworth really gets into his stride as a detective in this book. When the police inspector assumes that the corpse with the shot-away face is that of Hamlin Price's male secretary, it is Tuckworth who points out, "Note his fingernails .... Not just dirty. Cracked and broken. And his knuckles are gnarled. This man, whoever he was, was no secretary". And in the end it is only he who could fit the missing pieces of the puzzle together. "It was his gift, like it or not, to see what lay invisible to others." The real-life painter John Constable appears briefly in the story, and advises Raphael to go in for landscapes! One of the main characters who befriends Tuckworth is Leigh Hunt. It is explained in the next book that he is "the famous critic and poet". It seems slightly odd to introduce real people in this way, but perhaps it adds to the entertainment value. It all makes a much stronger and more convincing story than that of the previous book and holds the interest throughout. Recommended. The Devil's Game is set in Bellminster in 1834. A by-election takes place, and Whigs and Tories hire gangs to fight it out in the streets. Two people end up murdered, and Tuckworth soon gets involved. He, his daughter Lucy, and Mrs Cutler are now looking after young Bit, aged about six, rescued at the end of the previous story. Raphael and Lucy's relationship does not seem to be prospering. Tuckworth himself is as full of doubts as ever: "There it was, that cloying, wheedling seed of guilt, a guilt bred of uncertainty, of doubt, the dean's old disease". Then there is Joe Smalley, a nasty, vicious, powerful little dwarf, and Kitty Wren (full of "a raw and feral hatred"), a singularly violent, aggressive and unpleasant girl. And even Tuckworth's old friend, Lord Granby, is becoming increasingly old and unhappy. Mr Mortimer, the Rector of Bellminster, described as "young and severe", and ever critical of Tuckworth, is as wrong and unhelpful as ever. They could not be described as a very happy group of characters. The plot, except for its few moments or real violence (as when Tuckworth, up on the roof, fights young Kitty for his life) is rather slow-moving, and the political skulduggery is not made very engrossing. The world of politics, the mayor's wife tells Tuckworth, is "a filthy, wretched business, rotten to the very pit. Governed exclusively by results, you understand. Not ethics or morality, just results. It is itself the great end, for which all means are justified. No man comes near it who isn't spoiled by its contagion". Tuckworth, accused of being "a rash fellow in search of adventure to color your waning years", can't help wondering if he isn't just a meddler in affairs that did not concern him, but is encouraged by the chief constable to regard himsef as "a civilian agent of the force .... a sort of consulting investigator". It is he who identifies and discovers Kitty - but then finds that he cannot help her. He wonders,"What right had he, a man with no faith, no God, to seek redemption for another, even earthly redemption, redemption from violence and despair? What was he really seeking? Was it the boy (actually, as it turned out, the girl) he was trying to save, or himself?" In the end, he does not seem to save either, so the total result isn't all that satisfying. There is little information about Holland on the web except for a brief biography on the Writersnet site. Words that appear on every cover are An Unlikely Mystery. True enough. Another stylish cover. Set in pre-Victorian London, this is the best book in the series.